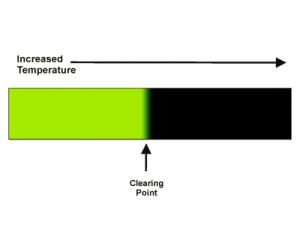 Thermochromic Liquid Crystals(LC s) are optically active mixtures of organic chemicals that can be formulated to be highly temperature sensitive and when used in certain conditions show many different colours as pass through their liquid crystalline state or can be tuned to just change through a single colour. 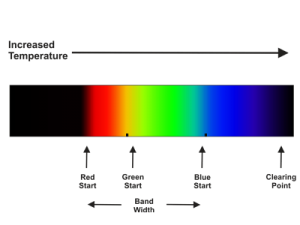 Normally printed onto a black background they initially show in a black state below their temperature rating and then pass through the colours of a rainbow as light is reflected at different wavelengths as they pass through their “liquid crystalline” state and then show as black again once the temperature is outside of the range and they are fully liquid in their isotropic state. 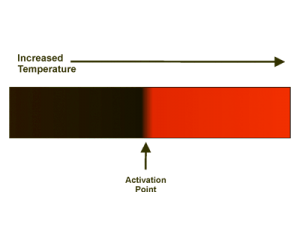 Different formulations can be tuned to show just a single colour either below or above their rating providing simple, clear and easy to read indicators. All these materials are reversible and as such can be used time and time again. Further technical information can be found in our Liquid Crystal Technology Handbook.